The NVA prison camp lay shrouded in mist laden darkness among the tall deciduous trees of the tropical rain forest. Their massive dark trunks and spreading branches blocked out most of the sun's rays. The small camp high in the clouds, lay along a flat-topped ridge nestled among the rugged mountains. In the enclose stood three large open-air cages, built off the ground with frames of solid teak and floors of sturdy saplings. The roof was thatched with palm leaves to afford some protection from the weather, but the four walls of each cage had been constructed of vertical saplings, like the floor, three or four inches apart to permit the inhabitants to be viewed by their keepers from any location in the camp. The camp was well camouflaged, and difficult to spot from the air. Fifty prisoners languished in the cages, subjected to a continual diet of torture, harassment, interrogation and political indoctrination conducted at bayonet point. Physically weakened inmates, suffering from an advanced stated of depression, frequently died or were killed by their North Vietnamese captors. The winter monsoon season in this area lasted from November through February. September was a particularly bad time for us. It was at the height of the transitional dry season between the monsoons, and enemy activity was always at its greatest during this time. One day, two NVA soldiers walked into our base camp and surrendered. During interrogation, they identified themselves and their unit and told us they had been guards at a mountain prison camp housing 50 inmates. Among their wards were a Korean marine and two Americans. The remainder were South Vietnamese soldiers and civilians. The information from the two prisoners was reported immediately to our commanding officer, Colonel Meinzen, who decided to act quickly, knowing time would be critical to a successful recovery operation. One of the NVA prisoners volunteered to lead the way back to the camp. At the time, my platoon 2nd Platoon, Charlie Company, 1st Battalion, 327 Airborne Division – was located on the north side of the Tuy Hoa Valley. I was quickly briefed on the background information gleaned from the two NVA deserters and ordered to bring my platoon across the valley just east of Hill 51 to link up with the Brigade's short-range reconnaissance element, Tiger Force. When they told me one of the NVA prisoners was going to lead us to the camp, the hair rose on the back of my neck. I had been in Nam long enough to be aware of that trick. The mission had ambush written all over it. I assembled my battle-weary troopers and briefed them on the mission. Their gaunt, pallid faces remained expressionless as I broke the news. These courageous young soldiers had stood up well under months of intensive daylight combat patrols and night ambushes, even though the gruelling pace had reduced their numbers to a mere 15 effectives. These survivors accepted the mission as just another bad news day as they stoically saddled up to move out. I couldn't have been more proud of them. It was late afternoon when we set out for the rendezvous with Tiger Force. We cautiously entered the broad valley, crossing endless rice paddies as we moved toward the fallow fields on the opposite side. The long shadows of day's end flowed over us as we neared our destination. In the fading light, I kept the platoon moving toward the mouth of a narrow canyon. When it was too dark to see, I stopped the column and tried, unsuccessfully, to make radio contact with the other unit. I decided to spend the night laagered up in a tight perimeter in the sea of grass around us. But first I signalled my point element to swing 90 degrees to the east and move out for another 200 metres before we set up. In case we had been followed, I wanted to make sure the enemy found where we had been, not where we were. Wet from the waist down and hungry, we finally dropped into our night defensive perimeter, alert to the sounds of the night around us. When the grey illumination of false dawn announced the coming day, we came to full alert. It was danger time, the hour when the NVA preferred to strike. We remained hidden in the tall grass until the sun broke over the horizon to the east. The mountains beyond lay hidden in a blanket of white mist. It was there, among those shrouded hills, that the NVA prison camp lay. I signalled the platoon to move out, and when we arose from our grassy perimeter, we spotted the men from Tiger Force, standing not too far distant, watching us. Unknown to each other, we had passed the night less than a hundred metres apart. If the enemy had gotten between us, they would have had a field day. We completed the link-up and moved out toward the mountains. The sun began to warm the air above the timbered peaks. We would have to hurry to reach the cover of the trees before the covering mist burned away. Enemy observers high on the mountain would be able to see us out in the open valley. An abandoned mine field, lay just ahead. We would have to traverse it before we reached the safety of the jungle. When we neared it, I sent a few men ahead to probe for the deadly devices. It was slow, dangerous work, but finally we were able to pass through the invisible corridor to the safety of the mountain range – that is, if treading onto the home turf of the NVA 95th Infantry Regiment could be considered safe. With Tiger Force in the lead, we moved into the jungle and soon discovered a heavily used high-speed trail running up into the mountains. We decided to use this ready means of passage to reach our final destination. Time was of the essence if we were to free the prisoners, and our NVA scout indicated it was going in the right direction. We began to climb up the trail, expecting at any moment to hear a distant signal shot notifying all the NVA in the area of our presence. But only silence greeted us. More and more, I began to believe we were heading into a cleverly planned NVA trap. Had our commander been fooled into sending us on a suicide mission, led into an ambush by our overly willing NVA guide? Having just begun to recover from heavy fighting at Dak To in June, we were not anxious to walk into another bad situation. The column stopped suddenly. Tiger Force's point element had located an abandoned enemy outpost in a cave alongside the trail. After checking it out to make sure it was empty, we again moved out, climbing even higher. The column soon stopped again. Sgt. Christian Girard, one of my close friends in Tiger Force, walked back down the trail to tell me they had found a second outpost and were making certain it was empty. Chris had once been a member of 2nd platoon and was an excellent soldier. Suddenly, a shot rang out ahead of us. Members of the recon until had discovered that the outpost was manned by several guards, and one of the younger Tigers had shot one of them. The shot would alert all the NVA in the area to our presence. We decided to race toward the camp, which was still a good distance away. There was no time to deploy our force, or to fire and manoeuvre. We had to reach the prison compound before the guards moved or killed the inmates. We ran straight up the trail, throwing caution to the wind. We reached the prison camp in late afternoon, not even realizing we were there until we ran out of trail and were forced to stop and look around. Tucked away among the foliage were camouflaged structures, including three large tiger cages. We fell silent, and our eyes widened in horror at what we saw inside them. Seeing fellow humans in such an emaciated, grotesque condition was almost more than we could bear. Most of the 50 prisoners were gone. Only eight remained obviously too weak and feeble to forced marched. They watched us passively through sunken, dark eyes that had lost their spark of life. The air in the camp reeked of death, decay and human misery. As our eyes grew accustomed to the shadows in the heavily concealed camp, we noticed a number of elongated mounds around the prison's perimeter. They were shallow graves. Nearby were the bodies of several prisoners, wrapped up and tied to poles, awaiting their place among the graves. Perhaps, these were the lucky ones. They had escaped forever the living hell of the prison camp. The survivors were at the end of their strength. Weakened from starvation and racked with scurvy, their swollen joints and bony limbs told us why they had not been evacuated with the rest. These inmates could barely walk. The NVA had left them because these prisoners could not keep up; the NVA knew we would stop to care for them. The eight prisoners seemed indifferent to the fact that they had just been liberated. They kept their eyes to the ground, heedless of what was going on around them. In the distance we heard the excited voices of several Vietnamese. No one needed to draw us a picture. We knew it was the camp guards shouting commands as they herded the rest of the prisoners down the trail, deeper into the mountain forest. The voices faded into the distance. I was told to take my platoon in pursuit of the prisoners and their guards, and to try and catch up to them before dark. We saddled up and headed down the trail. We all knew the danger in trying to pursue a fleeing NVA unit down a high-speed trail. The enemy knew all the right spots to set up an ambush. We moved at a silent, fluid pace. I knew that if we hugged the inside of the curves as we moved, using the brush and trees along the trail for concealment, the NVA were not as likely to hear or see us as we approached. Leading the patrol, my eyes shifted constantly back and forth, trying to locate the enemy before they spotted me. After covering a hundred metres, two or three steps at a time, I stopped listening. An instinctive uneasiness settled over me. I could once again hear the voices of the NVA guards far ahead of us. Scanning the terrain to my front, I detected a faint rustling sound in the leaves along the side of the trail. Sidestepping slowly to the left, I eased the selector switch to full automatic and shouldered the M-16, sighting down the top of the barrel for a target – expecting that I was already one myself. A slight movement along the trail's edge drew my attention to a black object low to the ground. It was a prisoner, a dropout, who had failed to keep up and had been left behind by his captors. I had almost shot him. Moving up cautiously, realizing that he could have been left as bait, I reached down to check the prisoner. It was a Vietnamese woman. I motioned for one of my men to come up and carry her back to the camp on his back. He was happy to oblige. We continued down the trial, slower now, still unnerved by the discovery of the woman. Then I spotted another dropout, right in the middle of the trail. Maybe the next one would be an NVA soldier waiting for me! I instructed another trooper to carry the Vietnamese back to the camp. Deepening shadows warned of the sun's setting. The night insects began to tune up as darkness approached. I knew we could not catch up to the NVA and their prisoners before night and made the difficult decision to return to the encampment. That decision still bothers me to this day. When we got back to the main body, we gathered what little food we had among us and gave it to our medic to distribute to the prisoners. When they had finished devouring the meagre rations, we left the camp in the direction we had come carrying the liberated Vietnamese prisoners on our backs. Darkness had settled over us, and we dropped off the trail into a dry creek bed. The NVA would expect us to use the trail. Finding some water among the huge boulders littering the creek bed, we satisfied our thirst and found some shelter under a wide limestone overhang. We would wait out the night before continuing our journey. At first light, we picked up our emaciated companions and moved down the creek bed until we reached the bottom of the narrow canyon where we had linked up with Tiger Force. Staying among the trees, we continued through the canyon to the open grass of the Tuy Hoa Valley. A short time later, medevac helicopters arrived on the scene to evacuate the liberated prisoners to a hospital in the rear. I led my dirty, ragged warriors back across the valley to our camp. There was no thanks, no well dones when we returned to the company. But we didn't need it anyhow. We were back with our unit… and still alive. It was enough. We found out later that one of the prisoners we had rescued died in the hospital. He had been a former VC who had defected and had been captured by his old comrades. He had undergone even harsher treatment than the other. Years after I retired from the service, distraught relatives contacted me about their missing loved ones. I called an acquaintance of mine who worked at the Pentagon and informed him of the Camp's location. I told him there were a large number of graves surrounding the prison camp that should be checked out to discover if they held Americans. He agreed and set up a meeting at his office. When I arrived, he showed me a map of the area and said, “Show me the spot.” After I pinpointed it and marked it with a sharp pencil, he went to a nearby filing cabinet and pulled out a portfolio containing the after-action report on our raid. The only American participants listed on the operation were the Tiger Force. Two months later, my friend called to tell me it had been verified through channels that a camp had been reported in the area. That's where it ended. When I subsequently reported this to another acquaintance, who was then serving on the Joint Casualty Resolution Team, he accused me of making up a war story. Several months later, that same individual wrote to offer me a job with the JCRT if I would renounce the methods SF personnel had been using to return live POWs. That's when I realized those empowered to do this job had no intention of bring out any live MIAs. They didn't care. After World War II, Korea, and Vietnam, it was always the same. Our country failed to bring everyone home. Is this what we are to expect from our government? Charles A. McDonald is a personal protection specialist in Pittsburgh, Pennsylvania. He is a retired U.S. Army chief warrant officer and served with the 101st Airborne Division and the 1st, 5th, and 7th Special Forces Groups (ABN). While serving in Vietnam, he was assigned as an advisor to the Vietnamese 7th Airborne Division, Project Delta and as an advisor in the MACV Recondo School. This article was originally published in Behind The Lines magazine. 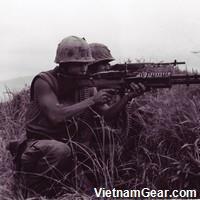 VietnamGear.com has reproduced this article with the kind permission of Gary Linderer.